Journalist and writer Adam Powley has produced this memorable pictorial book of cricket until the end of the last century with the help of many superb photos from the Mirrorpix collection. Although concentrating predominantly on the last century of cricket, there is a brief introduction from the 16th century to 1919 and those of us who have been fortunate to play at Hambledon, the cradle of cricket, the photograph of The Bat and Ball Inn will evoke memories even if we were not present at the time of the photo! The book takes us decade by decade with concise details of each period and beautifully adorned with many rare photos from the obviously vast Mirrorpix collection. I have to say that, having seen many cricketing photos, there are far more in this book which I have never seen before and makes it a fascinating book. Intertwined with the social scene mentioned in many of the decades, we are shown scenes ranging from Old Harrovians cheering their school on in the traditional Eton and Harrow annual fixture at Lord's through an impromptu war time match during a spare few minutes played by people with gas masks on to David Gower's wedding in 1992. Many aspects of the game are covered with amusing quotes. Former England Ladies captain, Rachel Heyhoe-Flint, was once asked if women wear protective boxes and the answer was " Oh yes. We call them manhole-covers." We are treated to many varying scenes of how and where cricket has been played. Within this book you will see what seems to be a very decent bowling action of HRH The Duke of Edinburgh, East Moseley's resident dog collecting a cricket ball from the nearby Thames, the lengths to which fans would go to get into a Test and a bizarre photo of a Somerset drill carrying rifles in 1959. Coupled with two primates dressed up as cricketers and a dog answering a call of nature by the stumps watched by an astounded wicketkeeper this book takes a nostalgic view and, as Adam Powley writes, a celebration of cricket's customs, oddities and curiosities. 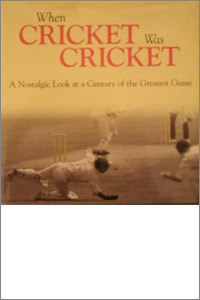 Legends of each era are given a good mention but, as the author writes, some may well be pleased with his choice, others not but, cricket being a game so open to opinion, his choices are included for their embodiment of a particular era whilst also accepting the constraints of time and space. Adam Powley's infectious love of the game is very evident and we must be grateful to him that he has produced such a memorable and different historical book.